Powers/Abilities: The Axi-Tun generally did not have superhuman abilities, though there are a number of mutants, mutates, cyborgs, etc., that have varying capacities for energy-manipulating powers. Traits: The Axi-Tun are humanoid in appearance, with two eyes of varying colors, five fingers (with opposable thumbs), five toes, pink skin, and an average height of 6'4". Their level of technology is superior to Earth's, with faster than light spacecrafts. The Axi-Tun believe themselves to be superior to all other races, and further value purity within their own race, looking down on mutates, mutants, cyborgs, etc. Some Axi-Tun rulers have sought universal conquest, while others have desired simply to distance themselves from other races to prevent themselves being sullied from interaction with "inferiors." Votan, in particular, sought destruction of all other races with spread of the Axi-Tun throughout the universe. (Giant-Size Fantastic Four#3 (fb) - BTS / Official Handbook of the Marvel Universe#5) - In the distant past, the beings known on Earth as the Four Horsemen of the Apocalypse -- Death (Rowregyynac), Famine (Krowtanem), Pestilence (Yentron), and War (Linbythoum) -- served as the soldier-elite to the Axi-Tun. Per Pestilence's note, they each had power enough to rend galaxies. "They lived more eons than countless star systems have existed. And throughout that infinite eternity they have battled for lives, for souls, for powers in far-stretching galaxies that even gods never traveled." (Giant-Size Fantastic Four#3 (fb) - BTS) - In order for the Axi-Tun to conquer several other civilized worlds, Earth had to fall first. (Giant-Size Fantastic Four#3 (fb) - BTS) <"millions of millennia ago"/"eons before humanity breathed in its first glimmers of intelligence"/"while you were still mindless primitives"> - The Four Horsemen of the Apocalypse came to Earth and took it as theirs, and "with the power of gods eternal, we held it against all our alien foes." (Giant-Size Fantastic Four#3 (fb) - BTS) <"when humanity was no more than barbarians"> - Eventually a race came to Earth which was even mightier than the Horsemen. After a century-long battle, this other race humbled the Horsemen and banished them like whipped dogs. Still enraged over their defeat, the Horsemen returned to their homeworld, Tun, only to be branded cowards and traitors for their failure. The Horsemen were exiled to wander the Universe for Eternity. They saw many wonders, witnessed worlds newly born, and worlds perishing from their own misuse of power, but still they seethed with hatred at their forced exile and at the world that caused their downfall." (Invaders I#2 (fb) - BTS) - The Axi-Tun Mcm-Xli served both as navigator of the nebula-cruiser Tekeli-Li and as mate to her three crewmen, to help relieve the monotony of their lengthy space voyage. (Invaders I#2 (fb)) - <"Long months" before late December, 1941> - The Tekeli-Li crash-landed near Germany's Siegfried Line, and the energies released in the resultant explosion destroyed the body of Nazi soldier Werner Schmidt. (Invaders I#2 (fb) - BTS) - The Axi-Tun crew saved Schmidt's brain and eyes, preserving them in a transparent tank and attaching it to a humanoid metal body. (Invaders I#2 (fb)) - The Axi-Tun crew awakened Schmidt and equipped him with hearing devices. Thinking Schmidt was no threat to them, they showed him their vessel's energy source, a strange glowing ring-like object (the "Ring of the Nebulas") designed to magnify the power of any mechanical device. Schmidt's cybernetic nature led the ring to increase his own brain waves, enabling him to cast the four Axi-Tun into a deep trance; he soon claimed the ring and enslaved the aliens. (Invaders I#2 (fb) - BTS) - Schmidt (taking the designation Operative A.1416, aka Brain Drain) renamed the male Axi-Tun after Germanic/Teutonic gods Donar (Satorymho), Froh (Xepdgin), and Loga (Frobbank) (see comments), and Mcm-Xli after Brunnhilde the Valkyrie from Wagner's Ring operas, which were Hitler's favorite operas. (Invaders I#2 (fb)) - Enamored of Mcm-Xli, Schmidt attempted to make her his lover; however, Mcm-Xli either had more will power than the males, or the ring's power affected her less, and she rebuffed Schmidt, stealing the ring from him and fleeing. (Invaders I#2 (fb) - BTS) - Schmidt retained his augmented mental powers, which allowed him to maintain control of the Axi-Tun males, and his increased intelligence made him invaluable to the Nazi party, allowing him to establish an underground bunker near the Siegfried Line. (Invaders I#2 (fb) - BTS) - Bereft of her memories but retaining the ring, "Hilda" made her way to London, England. (Invaders I#1) <Late December, 1941> - When Captain America saved "Hilda" during a Nazi bombing of London, he discovered the ring as she dropped it. Though only able to recall her "Hilda" name, she had some vague memory of German territory on a map, and the suspicious Invaders brought her there to investigate, taking Namor's ship to the Siefried Mile. As they approached a crater Hilda recognized, Donar struck their ship with his axe, sending the ship flying out of control and causing them to bail out: As the ship landed on its own, Namor and the Torches were warned by Froh, Donar, and Loga to turn back or perish. (Invaders I#2) - Namor, the Torch, and Toro squared off against Donar, Loga, and Froh, respectively and relatively ineffectively. Meanwhile, Cap took Hilda into a cave for protection, and they were drawn to a near-kiss by gazing into each other's eyes until they were taken prisoner by Nazi soldiers and brought into an underground bunker under Brain Drain's direction. Brain Drain questioned Hilda on the Ring's location, but her memory continued to fail her, and when Cap asked what was going on, Brain Drain explained how he came to command the "Star-Gods." This information caused Hilda to remember her past, and she continued to resist Brain Drain's will, refusing to love any human, let alone something like him. Ultimately, she cast the ring into a tank of corrosive "eerie blue-green waters." Now knowing what she had been and with her ship totally destroyed, Mcm-Xli decided she could not abide living on the backward, savage Earth, and elected instead to perish, in the process, using her powers to prevent Brain Drain from perverting their science. As she prepared for the atomic fires to consume herself and her crewmen, Mcm-Xli, Brain Drain told her he had done everything for her, and she leapt into the corrosive tank, convincing Brain Drain to join her therein. The Axi-Tun males then abandoned their battles, returned to the base, and joined Mcm-Xli within the waters, now glowing crimson with seething, barely contained energies. As the Invaders fled in Namor's ship, the four Axi-Tun willed themselves into oblivion by fusing their own latent powers with that of the now destroyed Ring of the Nebula. They seemed to almost recreate the ring for an instant, until the energies reached critical mass and a localized nuclear explosion destroyed the base and almost everything in it. (Giant-Size Fantastic Four#3) - The Four Horsemen returned to Earth, planning to conquer it as they had planned to do in the past. They believed that their victory would redeem them to their people, and would open the path for further conquest for the Axi-Tun (who still longed for universal control), with themselves riding triumphantly in the vanguard. Pestilence unleashed a "Coma-Pox" which instantly sent mankind to sleep. 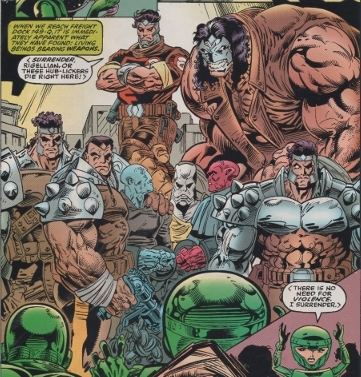 Only the Fantastic Four, with their unique body chemistries were able to regain consciousness in time to oppose the Horsemen. The Axi-Tun planned to conquer the Earth within 48 hours. However, when the Fantastic Four opposed them, they reactivated an ancient protection device left by the race which had defeated the Horsemen in the past. One by one the Horsemen were again banished from the Earth. (Quasar#14 (fb) - BTS) - The Four Horsemen were captured by the Stranger and imprisoned on his Laboratory world for study. (Quasar#14) - The Four Horsemen were observed within the Stranger's prisonworld. He was freed by the Over-Mind, who sought allies against the Stranger and his allies. (Quasar#16) - The Four Horsemen were brought into battle by the Over-Mind against Quasar and anyone else aiding the Stranger during the first assault, along with Dragonfly, Last Monitor, Captive, Gorr and others. The Axi-Tun immediately target Quasar as a unit. He contained them - along with himself - in an energy bubble and fought them, finally managing to knock them all unconscious after a physical fight. (Cosmic Powers Unlimited#4 (fb) - BTS) - The Axi-Tun historically maintained distance from other "inferior" races, wishing to remain clean of their sciences, resources, or worlds. (Cosmic Powers Unlimited#4 (fb) - BTS) - Lord Trantor taught the Axi-Tun that other, inferior races should be allowed to continue to exist as a yardstick by which Axi-Tun superiority could be measured. (Starblast#3 (fb) - BTS) - Nygorn of the Starblasters outmaneuvering the Axi-Tun aggregate in the Doomsday War. (Cosmic Powers Unlimited#5 (fb) - BTS) - Trantor's son Votan betrayed him. (Cosmic Powers Unlimited#5 (fb) - BTS) - Trantor's other son, Landar, became ruler of the Axi-Tun. (Cosmic Powers Unlimited#5 (fb) - BTS) - Contrary to his people's belief in purity, Votan genetically mutated himself to gain great psychic powers. (Cosmic Powers Unlimited#5 (fb) - BTS) - Votan usurped leadership from Landar. 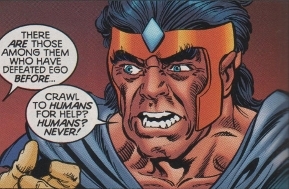 (Cosmic Powers Unlimited#5 (fb) - BTS) - Votan's psychic powers enabled him to use other races as fodder to forward his plans of conquest and force his people to accept anything he decided. (Cosmic Powers Unlimited#4 (fb) - BTS) - For years, the Axi-Tun concealed the revulsion that contact with "unclean species" evoked in them as they participated in the Charter league of civilizations. The Charter placed the Axi-Tun in charge of their peace-keeping militia. (Starmasters#1) - Votan's agent Ramrog used a Rigellian Planet-Lock to release giant planetoid hurtling into Arcturus IV, apparently destroying all life on the planet. Ramrog's astrogator Ghant notified him that all "inferior life forms" on the planet were purged, after which they prepared to recapture the planetoid. Rather than enjoy his success, Ramrog focused on the next target he had just been given, Earth. (Starmasters#1 - BTS) - When the Charter approached Earth to establish peaceful relations, Axi-Tun leader Votan's agents released their "hybrid cosmic plague" into the Hub, headquarters of the Charter, which killed everyone aboard. (Starmasters#1) - Aldebron contacted the Hub, demanding to speak with her ambassador, and communicated with Quasar, who had traveled to the Hub to investigate, only to awaken after a night's rest and find everyone else present there dead. 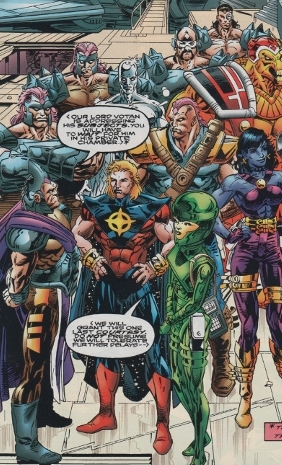 Quasar responded to Aldebron, and Siderius captured his image and message, then altered it into a message claiming credit for having slain everyone aboard the Hub, which they then sent to all member races, framing Earth, and Quasar specifically. The Charter dispatched their Cosmic Commando Unit to capture Quasar, but he fled, recruiting allies in Beta Ray Bill and the Silver Surfer. Ramrog's ship then materialized a ferrous planetoid (500 miles in diameter) between the orbits of Venus and Earth, sending it with great speed on course to strike Earth in under 5 hours; Ramrog worried that Earth's resourceful superhumans might foil their plot. (Starmasters#2) - As Beta Ray Bill, Quasar, and the Silver Surfer attempted to destroy the planetoid (which reassembled any damaged parts), the Cosmic Commando Unit was dispatched to bring in Quasar, engaging his allies as well. Realizing the planetoid was on a collision course with Earth, Commando leader Morfex decided saving Earth was a greater priority and ordered his agent Stenth to aim their decohesion beam at the planetoid. Stenth relayed the instruction to Command Central, and an apparent Axi-Tun superior ordered Morfex to not assist in destroying the planetoid but to follow orders and capture Quasar. Morfex nonetheless ordered Stenth to fire the beam at the planetoid, allegedly in order to flush out Quasar on the planetoid; when Stenth delayed, Morfex cast him aside and fired the beam himself. Stenth soon struck Morfex from behind with a handblaster (hitting, not blasting), knocking Morfex out and exposing him as a Skrull, after which Stenth cast Morfex out into open space, naming himself as the new Squadron Leader. Xenith saved Morfex, who revealed the treachery in the Charter, and the Beta Ray Bill, Quasar, and the Silver Surfer destroyed the planetoid. Xenith and Morfex joined the latter three, forming the informal Starmasters. Aldebron reported to Votan the failure of the Planet-Pulverizer against Earth. 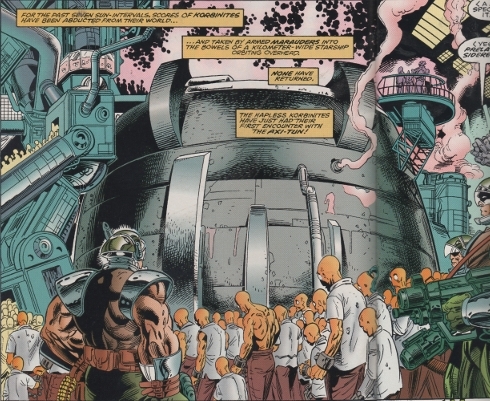 Having suspected the involvement of Earth's superhumans but not the Surfer's aid, Votan ordered Aldebron to summon Sidereus to convert some savages, intending to prevent Quasar and the Surfer from being there to protect Earth if/when other Charter planets launched retaliatory strikes against humanity for the assault on the Hub. (Starmasters#3) - Sidereus, backed by armed Axi-Tun soldiers (including Andrex), supervised the dumping of numerous Korbinites into the Cauldron of Conversion, in which they were dissolved. Upon determining the Korbinites had been fully "converted," Sidereus ordered the remaining Korbinites to be dumped out of an airlock. Shortly after Ghant informed Ramrog that Earth had survived their planetoid bomb, Votan contacted them and ordered they purify themselves to atone for their failure. They complied, blowing up their ship and killing themselves and anyone else aboard. When Tana Nile led a group of Recorders and 3 other organic beings to investigate the Hub, Axi-Tun troops, led by Dhampyre and Throk, captured them. The Starmasters (minus Morfex, who flew the ship to meet the others) arrived to investigate soon after, and Sidereus sensed their approach, warning Dampyre, who insisted he be allowed to tackle the Silver Surfer. They split into two teams, and someone (Sidereus?) subdued Beta Ray Bill and Quasar with intense gravity, while Dampyre drained the Surfer's energy and Throk incapacitated Xenith; when Morfex arrived soon after, Throk ambushed and captured him as well. Sidereus prepared the Cauldron for them, but Beta Ray Bill was able to cast his hammer at Sidereus; but Beta Ray Bill and the hammer both abruptly vanished (summoned to Asgard). As Morfex, Quasar, Surfer, and Xenith were cast into the Cauldron, Quasar recovered and protected the others with quantum energy fields, then drilled through the Cauldron's bottom to escape and plugged up the leak so their escape wouldn't be discovered. (Cosmic Powers Unlimited#4) - Learning of Tana Nile's kidnapping and the presence of a toxic residue in the Hub's filtration system, the Rigellians resolved to investigate the Axi-Tun with the potential for having them expelled from the Charter. Examing the Cauldron's protoplasm, the Surfer determined it to have limited sentience and could communicate with Korbinites (like Beta Ray Bill), after which the Surfer departed to locate Beta Ray Bill. While Sidereus rejoiced in the seeming destruction of Quasar and the Surfer, Aldebron noted that many of the Charter member's home planets had sent bounty hunters and assassins after Quasar. She had Sidereus doctor another message using Tana Nile's image and voice, which informed the Charter that they had seen to Quasar's death, that the Hub was now secure, and that they could now send detachments to bring their dead back to their home planets. The M'Davians did so first, but as M'Duul arrived on M'ndavi, his body ruptured, releasing the plague, which killed everyone on the planet within hours. Aldebron soon reported the M'ndavians' extermination to Votan, further noting that the deaths had been attributed to germ warfare by the Pheragots. Votan then spoke before a gathered crowd, noting how the dead ambassadors would serve as vessels to bring genocide to each of the Charter's races, allowing the Axi-Tun (the "Crown of Creation") to possess a cosmos cleansed of all inferior species. While Votan's psychic powers allowed him to manipulate the masses, his brother, Landar, wondered how Votan had subverted his people's will so thoroughly. Landar vowed to put his brother back in his place. Back aboard the Axi-Tun ship, Morfex (aided by Quasar) posed as Sidereus and ordered the Axi-Tun troops to turn over the Rigellians to him (allegedly for even greater torture), rather than bring them to the Cauldron for Conversion. Tana soon telepathically learned how Quasar's message had been a fake. From two guards, Tana learned the security codes allowing their escape, as well as that the Axi-Tun's genocidal goal. The Surfer returned to the Hub with Bill, allowing him to safely communicate with the protoplasm, learning its nature and thus believing himself to be the last living Korbinite. Quasar led Morfex, Xenith, Tana Nile and the other former prisoners to the Hub and reunited with Bill and the Surfer, who revealed the plague, and Tana discovered the M'ndavians' fate. The Surfer then purged the Hub's corpses of the plague to prevent it being spread to other member races. Meanwhile, Sidereus learned of the imposture and realized the Starmasters' survival. Aldebron chided him for allowing the prisoners' escape as well, after which an Axi-Tun soldier brought in a Recorder he had stopped from transmitting their location to Rigellian high command. As Morfex's ship materialized near the Axi-Tun ship, the Starmasters approached from the opposite side, and Quasar enclosed the Axi-Tun ship in quantum energy, reflecting its energy blasts back on it. Enraged, Aldebron sent Dampyre and Throk to lead troops to fight the approaching Starmasters; Bill subdued the troops with a hammer strike. As the others fought Dampyre and Throk, the Surfer departed to locate the Cauldron. Quasar overloaded Dampyre with quantum energy and Bill flattened him. Throk tore Stormbringer from Bill's hand, only to be seemingly incinerated by a powerful energy blast/backlash as none but Bill could wield the modified hammer. Bill, Quasar, and the Surfer combined their powers to destroy the plague and cauldron. Though Aldebron vowed to eliminate the Starmasters, Votan predicted their failure as they had failed under more ideal circumstances. He named them as unworthy and ordered them to purify themselves. Aldebron thus set their ship to self-destruct, and Quasar detected the energy surge in time to transport the Starmasters out; they returned to Morfex's ship. Days later, newly elected representatives from the Charter's member worlds gathered at the Hub to finalize sanctions against the Axi-Tun. They expelled the Axi-Tun from the Charter and prepared charges against Votan. Meanwhile, having decided she should rule the Axi-Tun, Aldebron had secretly saved herself, Sidereus, and Throk(?). She vowed the Starmasters would die with more torment than has ever been known. (Cosmic Powers Unlimited#5 (fb) - BTS) - The Star Masters accepted the Charter's request to travel to Tun and bring in Lord Votan. (Cosmic Powers Unlimited#5) - The Starmasters arrived on Tun alongside Tana Nile and agreed to wait until after Votan had addressed his subjects. As Votan denounced the Star Masters as unclean and inferior band of criminals, Landar vowed that Votan would answer to his crimes, but to the Axi-Tun, not the Charter, who were not fit to judge their superiors. Votan soon confronted the Star Masters, using his psychic powers to siphon their wills as his alien agents subdued them; only Beta Ray Bill retained his will, but he, too, was overpowered. Votan subsequently forced Quasar to "confess" before the Axi-Tun people that he was the true architect of the assault on the Charter and had framed Votan, and that they had come to Tun to murder Votan and enslave the Axi-Tun. The Axi-Tun people cheered as Votan order Quasar to slowly destroy himself with his quantum energy, while Landar prepared to rally the few remaining who were loyal to his rule. Meanwhile, a Pheragot starcruiser led by Tiborgh prepared to assault Tun with thousands of Regenerative Warheads, wiping the Axi-Tun from existence while transforming the planet's surface. Lacking the will to fight, Tana nonetheless managed to channel what remained of her own and the other Starmasters into Quasar (who possessed the strongest will of them all). As Landar stepped forward with his allies and denounced Votan's deceptions, the amplified will power enabled Quasar to break Votan's control, exposing Votan's mutation to the Axi-Tun. Quasar broke off his confrontation with Votan upon discovering the Pheragot starship's approach. With Votan's attention focused on Quasar, the other Starmasters regained their own wills and broke free. Denying Quasar's warning of the Pheragot starship, Votan sent his forces against Quasar, but Votan helped fight them off and confirmed Votan's mutation and manipulation of his people, enabling them to resist his control. The other Starmasters soon arrived to fight off those still loyal too Votan, but while Landar learned the Pheragot starship's approach was real, he could not bring himself to working with "lower life forms." Morfex lectured him about placing his own prejudices above continued survival and told him they would save Tun without his aid. One of Votan's mercenaries, an super-strong apparent Axi-Tun mutate/mutant, agreed to help the Star Masters oppose the Pheragots, and Landar begrudgingly agreed to let his underground militia serve under the mercenary this one time. Despite Quasar and the Surfer's approach, Tiborgh launched an initial attack, intending to let Votan see what was going to happen to him before striking at the capital. 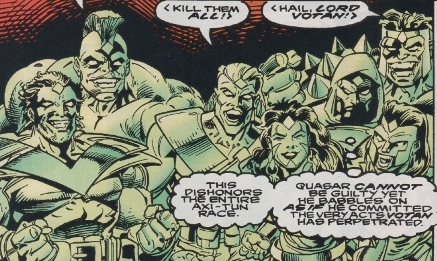 Quasar and the Surfer then stopped any further warheads from reaching Tun, and Tiborgh ordered an all out assault on the Star Masters, willing to sacrifice their own lives for a chance to end the Axi-Tun. 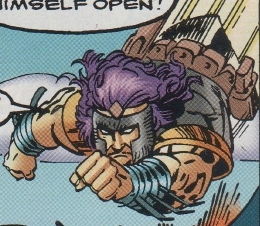 An Axi-Tun, friend to the mercenary, sacrificed himself to save Quasar from an attack, as Quasar had left himself vulnerable by focusing on containing the warheads. 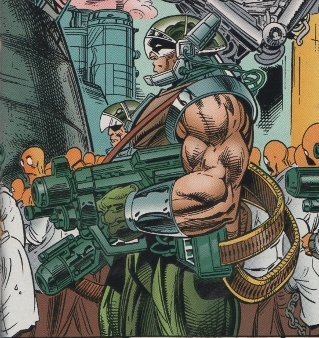 Enraged at his only friend's death, the mutant mercenary vowed to slay the Pheragots. 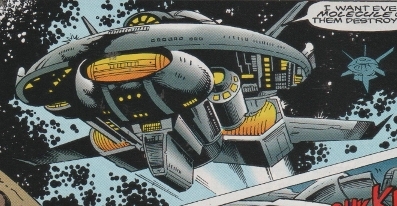 The Silver Surfer stopped the mercenary from attacking, and Quasar contained the Pheragot ship, preventing any further attacks on Tun. Meanwhile, Votan continued to enslave new Axi-Tun, sending them to war with those now loyal to Landar and the. Ultimately, however, all were freed from Votan's control. When Landar tried to take him custody, Votan psychically assaulted him, intending to escape, regain his strength, and retake Axi-Tun by force. Beta Ray Bill, however, subdued Votan, placing an aura of stasis about him so he could not affect anyone while it was in place. Landar demanded both the Pheragots and Votan be tried by the Axi-Tun, but the Starmasters convinced him the entire galaxy must have the chance to judge him. After Votan was transferred to Charter custody and Landar made arrangements for his testimony and defense of Votan at the Hub, Landar vowed to heal his people, ruling as his father had before him. He told the Starmastrs his people wanted nothing to do with the rest of the galaxy, and as long as they were left to their own, there would be no further conflicts. Landar further apologized to Bill for Votan's slaughter of his people, though he acknowledged he agreed they were inferior. Nonetheless, he told Bill he was the first Axi-Tun he might consider an equal. (Maximum Security: Dangerous Planet) - Delegate Alberik of the Axi-Tun was present at the Intergalactic Council meeting to discuss humanity's interference with universal affairs. When Ego the Living Planet began assaulting a number of planets, including destroying Krylor, Bartos of Krylor noted that humans had defeated Ego before and perhaps they should be contacted. Alberik insisted that they must never crawl to humans for help. After Charles Xavier harnessed the Council member's psychic strength in an assault against Ego the Living Planet, Council members still felt Earth a major threat. Wibbow of the Wobbow questioned what would happen if they moved against Earth and failed, and Alberik exhorted that it was cowardice to think that way, convincing other Councilmen to vote against Earth. Ultiamtely, the Council voted that humanity must be stopped. (Maximum Security#1 (fb) - BTS) - Per the Ruul's advice to the Council, intergalactic prisoners be sent to Earth to occupy humanity and prevent further interference. (Maximum Security#3 - BTS) - Alberik or other Axi-Tun delegates were presumably present when the Ruul were exposed as Kree, who then assaulted several of the Council's worlds. Comments: Space Gods created by Roy Thomas, , Frank Robbins, and Vince Colletta. Four Horsemen of the Apocalypse created by Gerry Conway, Marv Wolfman, and Rich Buckler. 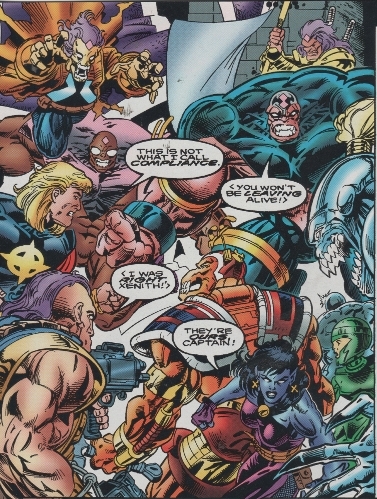 and the Axi-Tun name (and the linkage b/t the two above groups) was presumably created by Mark Gruenwald and/or Peter Sanderson or others in the original OHotMU team. As far as I can tell, the Space-Gods and the Four Horsemen of the Apocalypse were just from unidentified races until they were linked together and identified as members of the Axi-Tun race in the original OHotMU #5’s Appendix to Alien Races: Humanoid Aliens...which is the first time the Axi-Tun race is identified. other "Axi" characters, groups, etc. Andrex was a soldier enforcing the "conversion" of the Korbinites under Sidereus' supervision. His uniform was standard for the Axi-Tun troops. He may have been part of the troops later deceived by Morfex posing as Sidereus and may have perished when Aldebron detonated her own starship (if she didn't fake the ship's destruction as well as her own). Aldebron's ship housed the Cauldron of Conversion, and was apparently destroyed by Aldebron after she was ordered to purify herself for her failures. Apparently designed by Sidereus, the Cauldron of Conversion housed a semi-sentient protoplasm that consumed organic matter. This protoplasm then somehow allowed the synthesis of the "Hybrid Cosmic Plague." Every race sacrificed ("converted") in the Cauldron allowed it to mutate itself further, to adapt itself to become lethal to that species. Spread in am aerosolized form, the Plague was harmless to races to which the Cauldron's protoplasm had never been exposed. To races that had been "converted," however, the plague was almost instantly lethal. It could then incubate within a corpse and be released upon exposure to that race's native world's atmosphere. Korbinites and M'ndavians were exposed to the Cauldron and virtually exterminated by the plague. Apparently all members of the Charter had been exposed, as a representative from each race was slain by the plague. The Starmasters were dumped into the Cauldron, but Beta Ray Bill was magically transported back to Asgard immediately beforehand, while Quasar protected himself and the others with Quantum Energy fields. The Silver Surfer subsequently destroyed the plague within the Charter delegates to prevent it spreading further, and Quasar and Beta Ray Bill added their energies to the Surfer's to destroy the Cauldron. Ghant assisted Ramrog in using the Planet-Lock device to launch planetoids at worlds to exterminate their populations. Arcturus IV fell before them, but the Starmasters destroyed the planetoid when they targeted Earth. Ghant and Ramrog perished when they destroyed their own ship upon Votan's orders for their failure. (Cosmic Powers Unlimited#4 (fb) - BTS) - Father of Landar and Votan, Lord Trantor taught the Axi-Tun that other, inferior races should be allowed to continue to exist as a yardstick by which Axi-Tun superiority could be measured. He was one of Votan's mercenaries who fought the Starmasters, and he was the only friend of the big red mercenary. When the Pheragots assaulted Tun, he joined the Starmasters in opposing the Pheragots. Realizing Quasar was needed to stop the Pheragot's missiles, he flew in the path of an attack from behind on the undefended Quasar. He was apparently slain saving Quasar. He could fly in the upper atmosphere, via inherent or technological power. Votan secretly used a number of mutants, mutates, cyborgs, and possibly extraterrestrials to enforce his will. They attacked and subdued the Starmasters when all but Bill had their wills siphoned by Votan. When Quasar identified the approaching Pheragot attack, several of them joined in fighting off the attack.